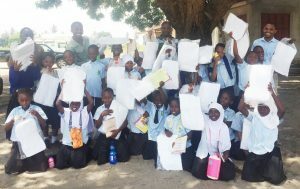 (Bagamoyo) The IHI Vector Control Product Testing Unit in Bagamoyo today hosted pupils from Stephen Tito Academy who visited the IHI Kingani site to learn about malaria research. IHI’s Emmanuel Mbuba, Mgeni Mohammed, Jason Moore and Edgar Mbeleya taught them about malaria and dengue. “We also showed them what we do at IHI to test the products that kill mosquitoes and prevent malaria,” reports Dr. Sarah Moore, who doubles as Head of the Unit and Deputy Head of the IHI Environmental Health and Ecological Sciences Department. The IHI Vector Control Product Testing Unit is an internationally renowned site for high quality evaluations of new vector control products for the private industry, product development partnerships, and regulatory bodies including WHO prequalification.